Dr. Bianca Zenor joins Purdue University College of Veterinary Medicine as the new director of the Veterinary Technology Program and clinical associate professor in the Department of Veterinary Administration effective April 10. Dr. Zenor joins Purdue Veterinary Medicine from Hill's Pet Nutrition, Inc. in Topeka, Kan. where she most recently served as senior manager of U.S. Veterinary Affairs since 2014. Prior to her work with Hill's, Dr. Zenor practiced mainly emergency medicine after switching gears from practicing at an exotics only hospital. A graduate of Purdue University, Dr. Zenor completed her undergraduate degree in biology followed by a master's in animal science before completing the doctor of veterinary medicine program at the College of Veterinary Medicine in 2001. She is looking forward to the opportunity of growing the Veterinary Technology Program both nationally and internationally and gaining a strong connection with current students who will be leaders in the veterinary profession. In sharing what drew her to this position, Dr. Zenor said, "I was interested the most in the veterinary technology director position because it meant going back home to a strong program that I truly feel is the best in the country. Also, veterinary technicians have been so influential in my career and life. Our profession could not function without them!" Born and raised in Greenwood, Ind., Dr. Zenor is happy to be back at Purdue. She's joined by her husband (also a Greenwood native), two children, two vet school cats who are turning 18 years old, a 14 year old cat and a dog. In her spare time, Dr. Zenor likes to spend time with her family, gardening, enjoying a good glass of wine and running marathons. She's completed eight! Dr. Zenor succeeds Dr. Christina Tran in the position. Upon announcing her appointment, Dean Willie Reed commended Dr. Pete Bill (PU DVM '80), PVM assistant dean for academic affairs, teaching and learning, who has served as interim director of veterinary technology during this transition period. Dean Reed remarked, "Because of his extensive experience and steady leadership, the program didn't skip a beat." 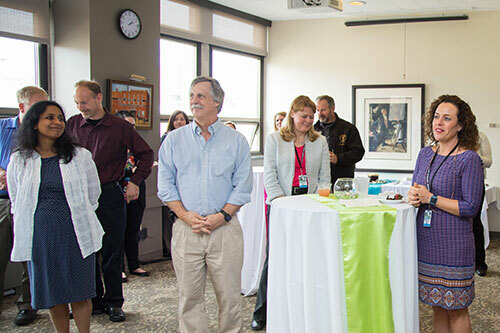 A reception was held yesterday (April 13) in the Alumni Faculty Lounges giving faculty, staff and students a chance to welcome Dr. Zenor. Dean Reed shared, "I'm just thrilled to have her back as a member of our faculty and assume a position on the senior leadership team and to lead our wonderful Veterinary Technology Program." Welcome back to PVM, Dr. Zenor! Purdue Veterinary Medicine faculty and staff enjoy refreshments as they pause for some welcoming words from Dean Reed at a reception in honor of Dr. Bianca Zenor, new director of the Veterinary Technology Program.